I finally bought an electric pressure cooker (Instant Pot) last Amazon Prime Day. Yes, I know, I’m behind on the trend. Call me old fashioned, but I find comfort cooking with my pots and pans on the stove! Admittedly, there is a little intimidation (and perhaps fear) attached to a device that could steam your face off or blow-up under pressure. Reading the ENTIRE manual and paying attention to what you are doing is a must when operating one of these things. 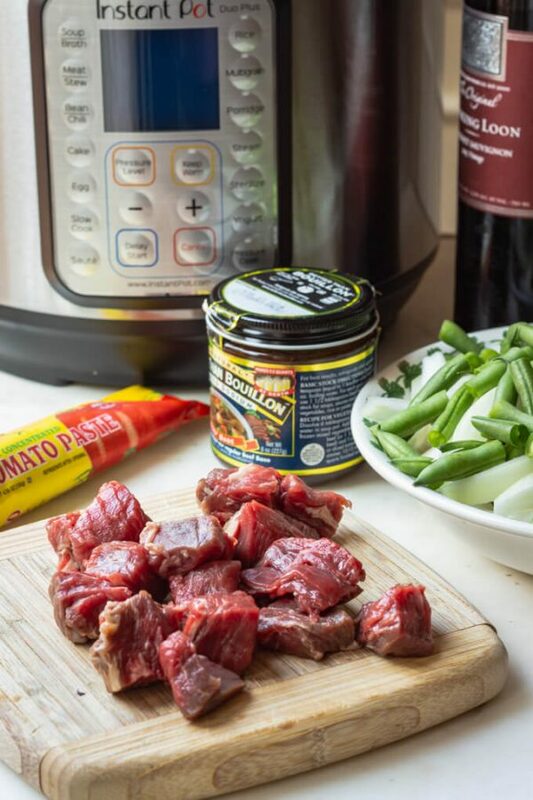 I don’t profess to be an instant pot or electric pressure cooker wizard like other bloggers, but I was pleasantly surprised with my first result. 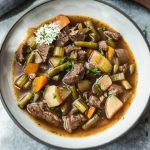 After a few tweaks, I was happy with this delicious vegetable beef soup. 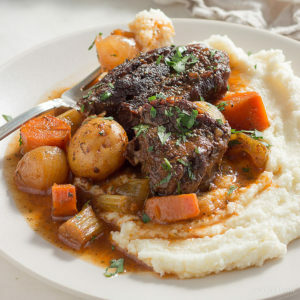 The first dish I made with my instant pot was a pot roast. I didn’t know that electric pressure cookers, like slow cookers, make liquid. 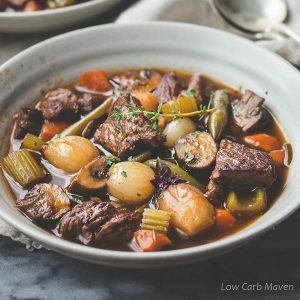 I put my chuck roast and vegetables in the Instant Pot and used the pre-programmed soup button. I had to do it twice since the meat wasn’t tender. By that time, the vegetables were mush and I had enough accumulated liquid to qualify the meal as a soup. But, it was pretty darn good! 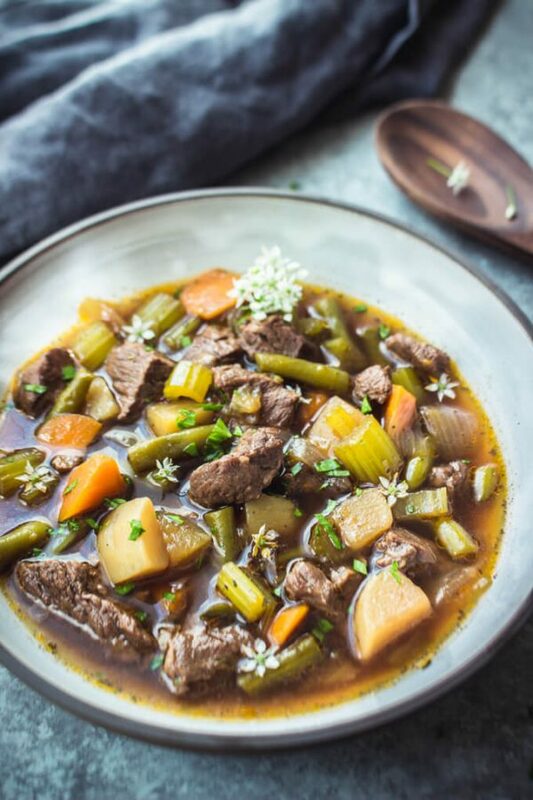 After a bit of tinkering and using my knowledge of slow cookers, I achieved a pretty amazing vegetable beef soup recipe. Not too bad for an Instant Pot newbie. 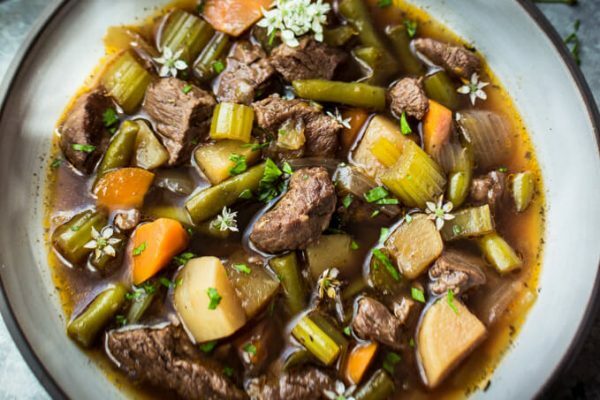 Slow cooking a stew or soup on the stove or in the oven concentrates flavor as liquid boils-off as steam. There is much less evaporation in a slow cooker or pressure cooker. Building and adding concentrated flavor is a must for that WOW factor. Use less liquid but make it count. Subbingna great low sodium chicken, beef, or vegetable stock for recipes that call for water is a great way to introduce more flavor. I bump the flavor even more with the addition of beef or chicken base. Yes, there is sodium and sugar in the concentrated base, but the extra flavor is absolutely worth it! Trim the beef chuck of fat and silverskin (tough sinewy membrane) and cut into 1/2 - 3/4 inch cubes. Peel and cut vegetables. Gather remaining ingredients. Add the rest of the ingredients to the pot (except those added after cooking) and stir together. Secure the lid to the pressure cooker and press the "Soup" button. Let the pressure cooker do its thing. Is there a way to change this for a crockpot?? As soon as I saw this soup on FB, I knew I had to make it! 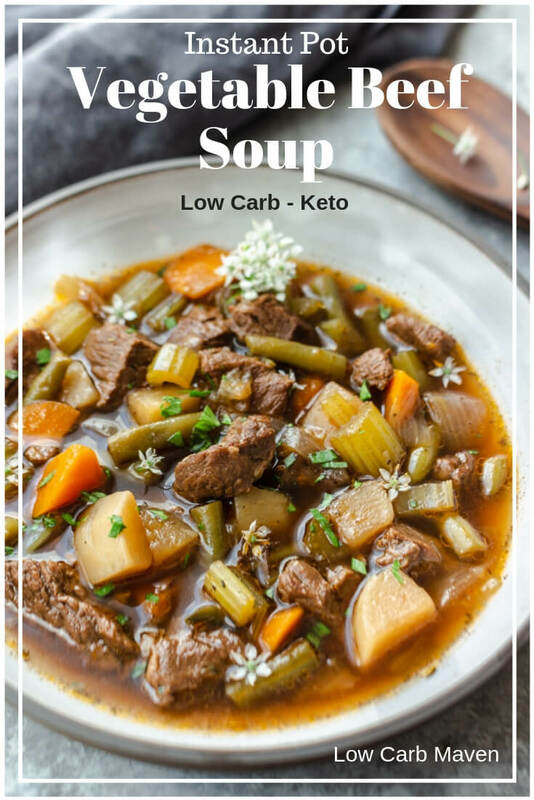 I love my Instant Pot but had not made a soup, perhaps thinking all the veggies would be mush and the meat would not be cooked enough. This soup came out perfectly! The veggies are cut thicker which probably accounted for them remaining solid. The flavor is so delicious, my husband kept commenting on how amazing he thought it was. I will be making this often during the colder months. Thank you, Kim, for stepping out of your comfort zone into the world of IP! We are all better for it. This has to be fantastic….love everything you have put in it. I highly recommend you also add some cabbage….it lends a sweetness that is really nice and so surprising for a super low carb veg. Who woulda thunk it. But I love cabbage in a beef veg soup. Completely agree with you on the celery root….great sub for potato, especially in a stew where you want something chunky. Thanks for another great recipe Kim, just in time for the crisper evenings we are now having. The Beef Stew looks pretty awesome too! That ought to be a great candidate for a pressure cooker. Will take your tips on amping up the flavor concentration for that one as well.